Say Hello to our latest menu additions. The Blueberry and Strawberry Waffle Cone Sundaes – The perfect sundae to eat on the go! 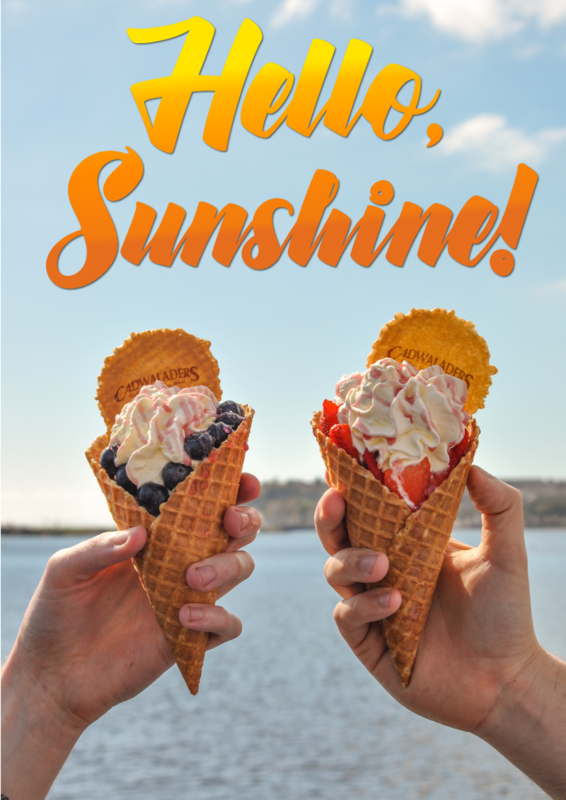 Made with a crispy waffle cone, filled with our delicious Cadwaladers Vanilla ice cream, Stuffed with your choice of Blueberries or Strawberries and finished with freshly whipped cream and sauce. The Mocha Muffin Sundae – Take your morning coffee to a whole ‘nother level! This double chocolate muffin is crammed full of Cadwaladers vanilla ice cream, a shot of real Cadwaladers exclusive espresso and topped with freshly whipped dairy cream, chocolate sauce and crumbled flake. The Turkish Delight ice cream hot chocolate – This latest addition to our I.C.H.C menu is a floral delight. The winning combination of Rose and Chocolate is brought to life in this indulgent treat. Finally we have the Raspberry and White Chocolate Waffle sundae – Tuck into the toasted Belgian waffle with Cadwaladers Vanilla ice cream and warm raspberry sauce. This decadent sundae is served with lashings of thick white chocolate and freshly whipped dairy cream.